The Condominium Conversion Handbook by CSI, Inc.
How to Convert to Condos! experience to work for you NOW. This is the perfect resource tool for Real Estate Developers and Investors, Professional Real Estate Agents, and Building Owners. The “Handbook” is your personal guide to the condo conversion process from finding the right property to convert to turning over the operation to the Homeowners Association. Others books may tell you how to go about converting, but this book shows you the way, step-by step. 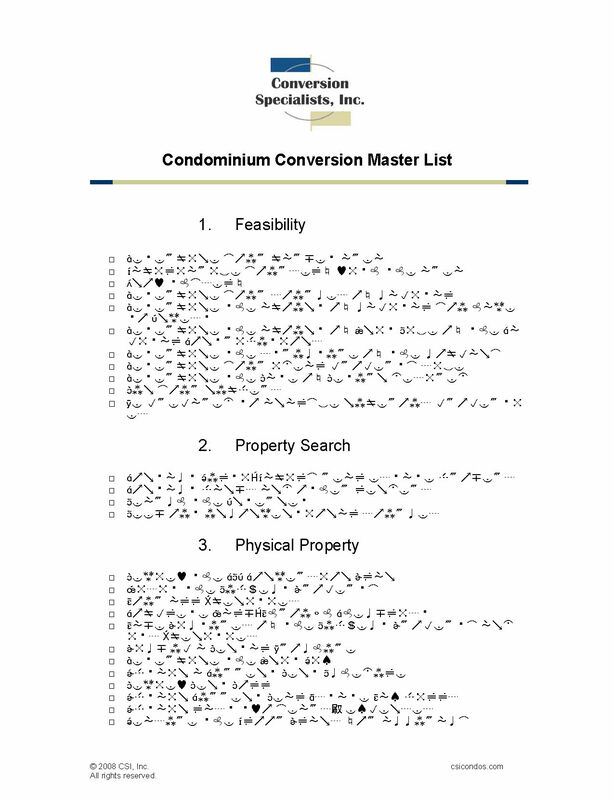 The CSI Condominium Conversion “Master List” has over 500 line items in 32 categories that have been compiled over the years to help you all along the way. Each Master List item is then further explained in detail in the 126-page Condominium Conversion Handbook. A list of 50 Attachments is included. Comprehensive and detailed worksheets are available to help you to quickly analyze potential properties and track your results on an on-going basis. Other critical forms are available for you to customize for your particular needs. The Handbook and all the supplemental materials are just a few keystrokes away! The CSI Condominium Conversion Handbook© & all supplemental materials are protected under copyright laws.